Remember the old telephone wires? What so special about them, you may ask. Well, I am particularity interested in their coil wires. Even tough they are short, they can be stretched to three four times of their original length. Instructable user instructable has come up with an Awesome handy trick, to make a coil cord from regular USB cables. 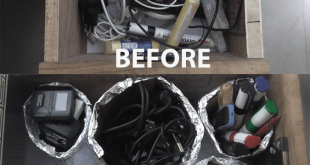 You can also convert your regular USB wires into USB coil wires using this tricks. This method also works fine for a monitor, keyboard, and mouse cables as well. Check out this detail Guide on instructable.